Marvel’s Agents of SHIELD, reviewed. Marvel’s Agents of SHIELD fails to save the superhero genre. 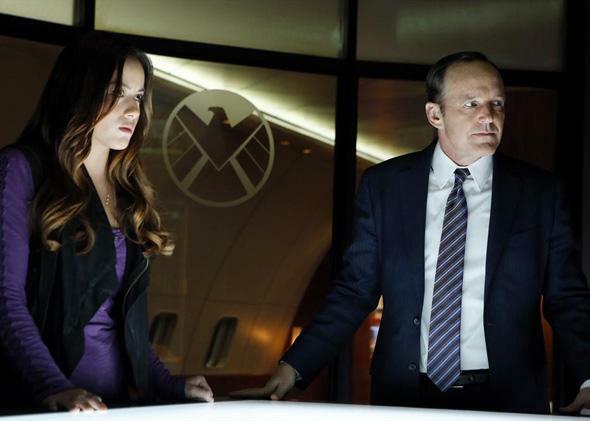 Shield your eyes from Marvel’s Agents of SHIELD, starring Chloe Bennet and Clark Gregg. Blessed with spectacular powers and physiques, superheroes have a firm handle on bad guys, psychologically distressing back-stories and, above all, the summer movie season. But this fall, instead of gracefully decamping for their ice castles and underground lairs and patiently awaiting their season of cultural omnipresence, they are stubbornly sticking around. Starting tonight, ABC begins to air Marvel’s Agents of SHIELD, a spinoff from last year’s The Avengers, the third-highest-grossing movie of all time. Due to the movie’s success and the involvement of Joss Whedon, who directed and wrote the film and the first episode of SHIELD, the show has already amassed more than a million fans on Facebook before airing even once. The series is as dull, small-minded, and mercenary as its cinematic progenitor was entertaining, attention deficit-proof, and mercenary, but it has a built-in audience. What’s that on your TV? Not a bird or a plane, but a canny cash grab. SHIELD begins some months after the climactic fight from The Avengers, in which a giant green man and his pals kept a bunch of aliens from laying complete waste to New York City, giving the citizens of the world a peek into the universe’s crazy side. In the battle’s aftermath, SHIELD’s Agent Coulson (Clark Gregg, reprising his role from various Marvel films) sets out to assemble a team to contend with odd supernatural cases and to mentor newly minted superheroes. The team members, all highly trained but not superhuman themselves, include two tech-savvy British chatterboxes, the stoic Melinda May (Ming-Na Wen), a confident female hacker named Skye (Chloe Bennet), and the loner Ward (Brent Dalton), who may, actually, have a special gift: an uncanny ability to resemble talking cardboard. These fine folks are not just Agents of SHIELD, but also the Catalogue Model Team, striking fear into the hearts of people with anything other than perfectly bland and symmetrical faces everywhere. Whedon wrote the pilot, but the whole project feels more Whedon-ish than Whedon-esque. “With great power comes a ton of weird crap you are not prepared to deal with,” Skye tells Mike Peterson (J. August Richards), a laid-off factory worker and single dad who is struggling with his new powers. The joke has all the classic Whedon insouciance, but is diminished as variations on it keep getting repeated. The pilot continually tells the audience that the agents will be contending with the strange, while showing us banal sights—heroes running into burning buildings, flying cars—we’ve seen many times over. The robotization of Whedon’s verbiage doesn’t stop there: “It means someone really wanted to spell out SHIELD,” Ward jokes about the provenance of SHIELD’s acronym, which stands for “Strategic Homeland Intervention, Enforcement and Logistics Division.” But in his mouth these words, not very many by Whedon’s standards, sound like they’re being emitted by a weakly charged Roomba. Agents of SHIELD feels like it has taken its new “small” screen surroundings too literally. The show has an opportunity to get into the details, politics, and character development that necessarily get excised from a two-hour movie, but forgoes it to be a slightly cheeky procedural instead. The light tone of The Avengers made it a great antidote to absurdly dark superhero films like The Dark Knight, but Agents of SHIELD is just Bones without the romance, CSI with alien artifacts, not blood spatter. The shame is that a series about a band of heroes trying to hunt down more potential heroes could be the perfect antidote to TV’s own overly dark cliché: the anti-hero. But instead it resists the call, too self-serious to be really goofy, and yet too fan-boyish to rescue even one hour of television from mediocrity.